A cataract is a clouding of the internal focusing lens inside the eye, which is normally clear in youth, gradually developing density over a lifetime. Cataracts typically do not cause visual difficulty until a person's late 60's or beyond. Cataracts develop because of a natural aging process in the lens itself. If we all live long enough, we will most likely develop cataracts. Ultraviolet (UV) exposure may play a role, but otherwise we aren't completely certain of the cause. Some cataracts occur in younger people because of direct trauma to the eye, such as getting hit in the eye with a hard ball, genetic conditions, or occasionally vitamin deficiencies. Wearing sunglasses in bright sunlight and eating healthy foods are suggested for everyone. Early on, cataract symptoms can be very mild. Many people first notice a distracting glare from oncoming headlights when they drive at night. It may require more and more light to comfortably read, even while wearing glasses. Some people notice that television captions become increasingly difficult to read. 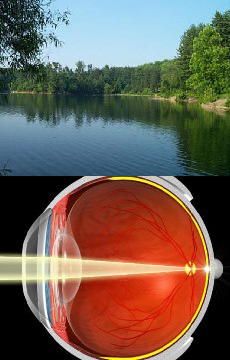 A healthy, clear lens focuses light directly onto the retina, causing a crisp, clear image to be seen. 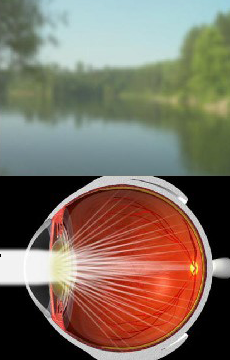 A cloudy, cataractous lens scatters light, only partially hitting the retina, causing a hazy image to be seen. Sometimes they do. During a routine complete eye examination, Mr. Srinivasan will evaluate your vision and the total health of your eyes, also screening for other disorders like glaucoma, macular degeneration, and diabetes. This allows him to determine whether a change in glasses would provide a significant improvement in vision. However, when cataracts become dense enough, even new glasses will not help because the eye is seeing through a cloudy internal lens that cannot be corrected with glasses. Cataracts cannot be reversed. Wearing ultraviolet (UV) protecting sunglasses may help reduce the progression of cataract. It is worthwhile for most people to investing in a good quality pair of sunglasses, which need not be very expensive. In addition, a balanced diet containing a reasonable amount of antioxidant vitamins may help prevent cataracts, while supporting overall health. When Should Cataracts Be Removed and Why? Cataracts progress at about the same rate in both eyes, however many people seem to notice cataract symptoms in one eye first. Mr. Srinivasan does not recommend waiting for cataract surgery until a cataract is "ripe", which is a very dense cataract. Rather, the decision for surgery is based on when visual difficulties begin to interfere with normal activities, like driving a car, reading, work, or hobbies. During an examination, Mr. Srinivasan can determine whether any other conditions such as macular degeneration are also contributing to difficulty with vision. Cataract surgery is performed with local anaesthesia only. Mr. Srinivasan provides intravenous medications to help patients fully relax. He will also administer local medicines around the eye so patients don't feel or see anything during surgery. The surgery takes about ten minutes in the operating room. Most people are in the surgery unit for a total of 90 minutes to 2 hours, including pre- and postoperative time. A small opening (less than 1/8 inch) is made in the front of the eye (the cornea) to allow the surgeon to dissolve the lens of the eye and remove it in tiny pieces. An artificial lens implant made of silicone or plastic is folded into a small package, then inserted into the eye and unfolded in the proper position. In this position, the new lens will remain permanently. It will never need maintenance or replacement. The new lens can be selected to correct nearsightedness or farsightedness. Multifocal Premium Lens Implants are available to correct presbyopia and Toric Premium Lens Implants are available to correct astigmatism. Most people say that there is no pain during or after cataract surgery. Some may experience a scratchy sensation (like an eyelash in the eye) and mild soreness for about 24 hours after surgery. Mr. Srinivasan will suggest medication as appropriate to your condition. For the first four hours after surgery, an eye patch is placed on the healing eye and the effects of anesthesia will be wearing off. During this time, Mr. Srinivasan will recommend restful activity. Eating, watching television, reading, and walking around the house are allowed. After the eye patch is removed, patients can begin administering their postoperative eye drops. For the first few days after surgery, heavy lifting (more than 20 pounds) is not allowed, and Mr. Srinivasan recommends avoiding eye makeup for one week. There are other restrictions as well after surgery. These are fully discussed with Mr. Srinivasan before surgery. For more information about restrictions after surgery, please contact us to arrange an evaluation. After cataract surgery it is impossible for a cataract to return because the lens of the eye, where the cataract grows, has been completely removed. It is possible, however, for a cloudy film to grow on the lens capsule membrane that is located behind the lens implant. This occurs in about 40% of cataract surgery patients, usually many months or years after surgery, and is sometimes called a "secondary cataract". Treatment of this film is simple and done with a laser as an outpatient procedure that involves no postoperative restrictions or downtime for most people. With the current technology, Mr. Srinivasan can offer to correct vision to achieve good uncorrected distance vision in both eyes. This allows most people to pass a driving test without glasses. In such a case, it would be necessary to wear reading glasses for fine print, though some large print reading may be possible without glasses. Another option after surgery is monovision, where one eye is corrected for distance and the other for near vision. This option allows many people both to read and drive without corrective lenses, but affects depth perception. This option is usually most successful in people who have previously worn monovision contact lenses or who have had monovision LASIK. Multifocal Premium Lens Implants are another method of achieving good distance and reading vision after cataract surgery. There are risks with every kind of surgery, and cataract surgery is no exception. The risk of severe complications, such as infection, severe bleeding during surgery, or retinal detachment are about 1 in 1000. Other, less severe complications of surgery may occur more frequently, as often as 1 in 100 times, and may include the need for additional surgery or prolonged recovery time with delayed visual improvement. This is not a complete list of risks that occur with surgery, and individual patients may have other risks based on existing medical or eye conditions. Mr. Srinivasan has extensive experience performing cataract surgery under a wide variety of circumstances, including unusual ones, and can fully discuss these risks during a clinic consultation. For further information, please call us on 01292 282100 with any questions, or to arrange an evaluation for treatment.